Job opportunities seldom diverge as greatly as they do for the former special forces operatives of J.C. Chandor's "Triple Frontier." There is selling condos or taking contract work in an African warzone. There's stocking shelves at Walmart or taking down a South African drug lord. And you thought your LinkedIn profile had inconsistencies. Yet those are exactly the kinds of choices facing a quartet of ex-military veterans who are rounded up, "Blues Brothers"-style, by Santiago "Pope" Garcia (Oscar Isaac), their former brother in arms who now works for a mysterious company contracted vaguely by "a foreign government." With the promise of that old temptation — "one last job" — and the potential for a major payday, Garcia gathers each old pal — Tom "Redfly" Davis (Ben Affleck), William "Ironhead" Miller (Charlie Hunnam), Ben Miller (Garrett Hedlund) and Francisco "Catfish" Morales (Pedro Pascal) — with little trouble. Once at the pinnacle of their profession, they're all struggling to adapt to civilian life. Davis is a divorced, heavy-drinking real estate broker with little talent for it. Miller is getting his face kicked in as a cage fighter. "I say we deserve better," Garcia tells Davis. "You've been shot five times for your country and you can't pay off your truck." "Triple Frontier," a Netflix release playing in theaters for a week before streaming, was first scripted by Mark Boal with plans for Kathryn Bigelow to direct. Both remain executive producers and Boal is a co-writer alongside Chandor. 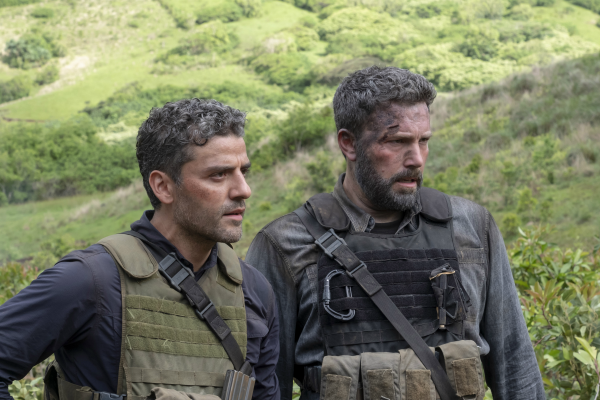 That "Triple Frontier" originated from the team behind "The Hurt Locker" and "Zero Dark Thirty" isn't surprising. It's similarly attuned to the under-rewarded sacrifice of elite American soldiers. But it's also a larger leap into genre. Bountiful in dudes, guns and action scenes, "Triple Frontier" is the kind of proudly macho movie that's perhaps too familiar to moviegoers — though such a starry, big-budget thriller is more novel for Netflix. "Triple Frontier" is both more and less than what it seems. The crew heads south to an unspecified country in South America (the title refers to the junction of Brazil, Argentina and Paraguay) where they plot, with the help of an insider (Adria Arjona), to take down a long-elusive drug lord named Lorea at his jungle hideaway and make off with millions. But "Triple Frontier" is only part heist movie. Its second half, a militaristic riff on "The Treasure of Sierra Madre," tailspins into a existential, survivalist thriller about greed and combat addiction. For many of the guys, especially Affleck's Redfly, being drawn back into the field is like relapsing. Trigger fingers again get itchy, to tragic ends. Allegories of capitalism have proven a passion for Chandor, who has made money an ever-present subtext in crime dramas ("A Most Violent Year," with Isaac as an ambitious heating-oil businessman) and survival tales ("All Is Lost"). His debut, "Margin Call," was about a Wall Street investment bank in the tumult of a financial crisis. With each film, Chandor's scale has expanded, and part of the thrill of "Triple Frontier" is the finely staged set pieces (including Garcia's opening siege of a discoteca) and the lush, wide-screen cinematography (via Roman Vasyanov). The balance of pulp and parable feels tenuously close to syncing, but never quite does. Part of the problem is that the five guys (probably a few too many dudes, if we're counting) — and every one of the Spanish-speaking locals — are too thinly sketched. Affleck draws the Bogart card from the "Sierra Madre" types, but the rest — talented as they are — don't come through clearly. Only Isaac, with remorse creeping over his face, leaves a mark. "Triple Frontier" has the good sense to take a macho, "Expendables"-like set-up and turn it inward. It just doesn't go far enough. "Triple Frontier," a Netflix release, is rated R by the Motion Picture Association of America for "violence and language throughout." Running time: 125 minutes. Two and a half stars out of four.